Flying a lot of Falcon 4 Allied Force these days ... Lousily, I must say. 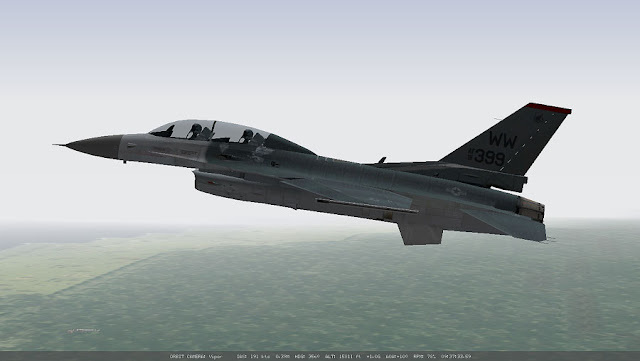 The nice thing about the F-16 is that the flight computer will do almost everything for you. I wanted to experiment a bit with a high angle of attack flight and see if I could sustain a level flight so I just had to pull and release the stick while reducing the throttle. 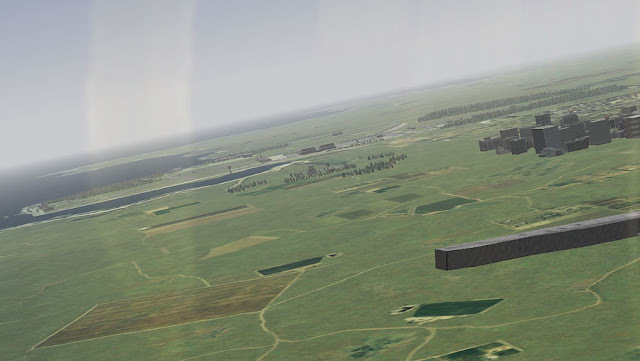 Training for level flying at a high angle of attack (10 degrees) and low speed (190 knots). Scary stuff, the F-16 gets almost unresponsive at these low air speeds. 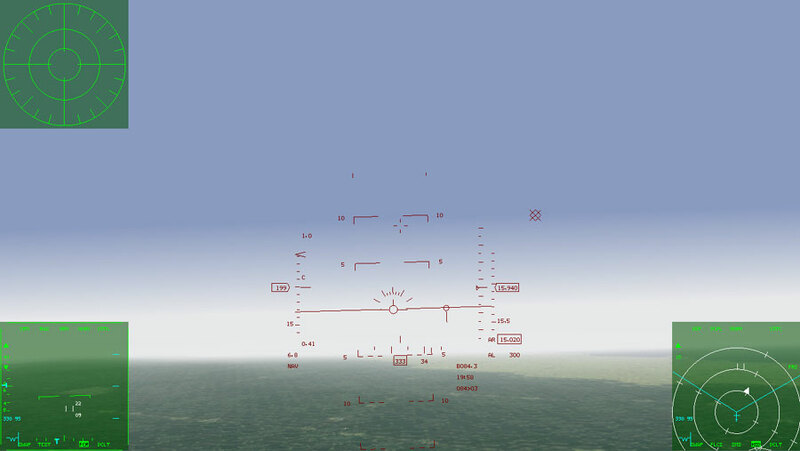 The HUD view. Note the flight path marker right at the artificial horizon. Fuel flow was around 1900 lbs per hour, so I could in theory have around 2 hours of station time. But this flying regime is cumbersome to keep and would not allow me to change course with the agility needed for a combat air patrol station. So I headed to base again, just to be berated for an ATC violation! :p.
Somebody at that airbase is having a blast bitching at my missed approach procedure. Doh! Always learning with Falcon 4! have you played open or free falcons? if you have what's your opinion on those? Induced drag: at high aoa, the pressure difference between the up and the down side of the wing is high. This difference creates vortices at the wing tips that dissipate your energy. Parasitic drag: When you fly fast, friction between the aircraft skin and the air dissipate your energy. When you fly at high aoa, you are forcing the plane to fly with higher than normal coefficient of lift. High coefficient of lift implies high induced drag, which is not good for efficiency. In addition, you need airspeed on your control surfaces for your aircraft to be responsive. At high aoa, you don't have that either because you are flying slow. If you fly fast, the aoa is much lower and induced drag gets lower as well. BUT you get increasing parasitic drag (drag due to air friction), which increases with speed. So, there is an optimal point in the middle where drag is minimum. This is where you fly for minimum fuel consumption. Altitude do also affects. If you fly higher, the air is less dense, and you can fly faster with less penalty due to parasitic drag. No I haven't. I was wondering the same thing (i.e. more content in those?). Thanks anonymous for your comment. Great feedback. Do you know what's that sweet spot where you maximize fuel economy? In the F16, it should be around 250-300 kts (indicated airspeed). I'm not familiar with the F16 avionics, but I'm pretty sure that the on board computer can give you the exact figure for your flight configuration (weight and altitude). Anyhow, there are two different figures to consider when talking about fuel economy: max range, and max endurance. Max endurance is how long you can keep airborne, and max range is how far you can go. The figures involved are slightly different, being higher the speed required for max range. If you want to cover ground, you definitively need some speed, right? If you think it, max endurance is of course the minimum fuel flow attainable for level flight at a given weight and altitude. At this speed, you're a sitting duck. Not good for combat. In a combat mission, you want to cover ground fast and efficiently (or maybe just fast :D). You are interested in max range not max endurance. The optimum speed depends on engine thrust, airframe aerodynamics, altitude and weight. As a test, you can choose a cruise altitude and fly a distance taking note on fuel flow at different speeds, say 200, 300, 400. With speed and fuel flow, you can compute your range at different speeds (range = total_fuel x speed / fuel_flow). You should see a pattern in your results. In RL, there are curves to get the right speed to fly, and typically an on board computer that does the job for you, because these figures change constantly as you burn fuel, release ordnance or change altitude. At normal altitudes your best speed for endurance will be at a constant AOA (or EAS for a fixed weight) and is your Vmd. Best range will be just over 30% faster than this, as long as the altitude is low enough to avoid transonic drag rise. At higher altitudes your TAS and range will be greater, but the difference in endurance should be minimal - L/D ratio remains the same, and engine power goes down, requiring a higher throttle setting (although with little difference to fuel burn until mil throttle isn't enough). Finally the drop tanks are for extending station time - you fly them to the station, then if hostiles appear dump them and engage... saves losing time on station, or having to top off from IFR too often. Avoid reheat like the plague - a few minutes during takeoff and climb may equate to half an hour or more on station at efficient cruise settings, with normal (ie not full) weapons load. At extremely high altitudes, induced drag goes up, and combined with reducing power, and the need for reheat as the ceiling is approached - max endurance and range fall rapidly. For high performance aircraft you also get pinned against the transonic region, with increasing mach drag. Of course, if you aren't fighting you can stretch a glide a very long way from the stratosphere, but it takes enough fuel to get there quickly, that you may be better off flying normally at an intermediate altitude, and then flying home at best range AOA/speeds. Woah! Fantastic analysis. Are you "anonymous" the same guys? I'd love to post these comments in the main body of an entry. Mine are the last two*. The preceding one was another poster. For simple analysis, assumptions like constant thrust and parabolic drag are acceptable, so long as you avoid using them for non-valid flight regimes (stalled, transonic).